All through the Christmas season, I saw advertisements for the most phenomenal and outrageous toys for kids. Many of them had to be charged up or plugged in! My memories rolled back to the years when we lived in a small Texas town and amused ourselves with simple toys. Our street ended at a large bar ditch. If was forbidden for us to play there, which made it more enticing. A sign in the middle of the road named our playground — “Dead End”. The street was caliche — it’s a word that seems to be peculiar to Texas, like sendero. Caliche is a fine mix of sand and gravel. Large road graders would push it up into mounds at the sign by the ditch. We made trails through it down into the ditch, different after each rain. The neighborhood kids had a collaborative venture at the Dead End. The boys would bring little plastic toy soldiers, tanks, jeeps, and flag poles. Being the only neighborhood girl — and well on a path to becoming an architect even in the second grade — I brought blocks of scrap wood and my dad’s little whisk broom. The broom was just perfect for sweeping roads, staging areas, landing strips and parking lots around my scrap block buildings! Our war zones could be fairly large — the whole width of the street and about 20-feet in depth! Battles, demolition and re-building could keep us busy for days. Rain gave us the opportunity to start over! 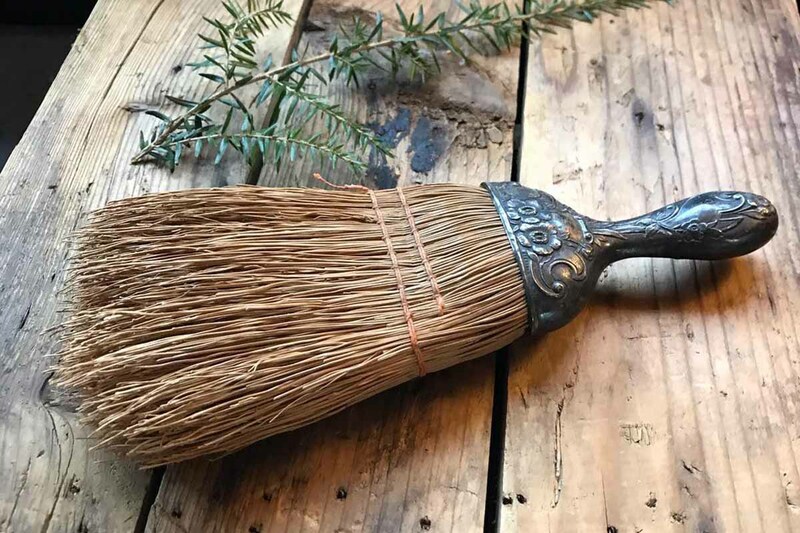 It’s the whisk broom that brings back bittersweet memories for me. My father was meticulous about keeping his little roadsters clean. His little broom always (most always) hung on a nail in the workshop. Every few days, he would open the car doors and sweep off the seats and floorboards (in that order). I can still hear him fussing out loud when he’d sweep across the upholstery and see a swath of caliche dust in the path of the little broom. Miss ya, Dad. Bought my own little whisk broom this Christmas! From a wonderful little Etsy Shop in North Carolina called Vintage Supply Co. I won’t use it to sweep gravel, I promise.